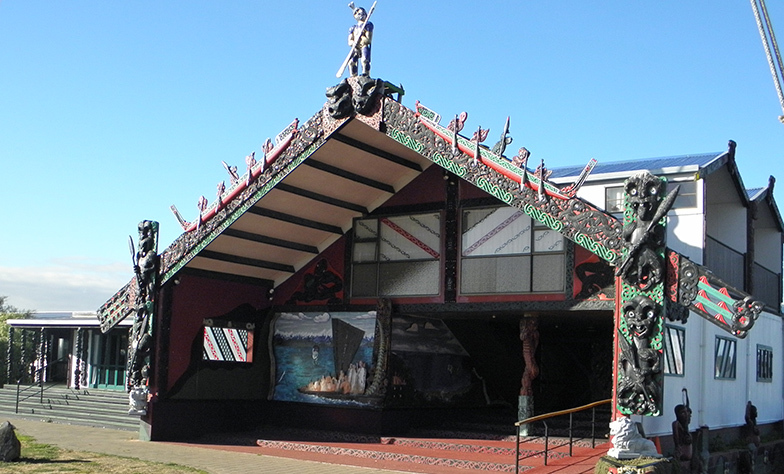 Located on the outskirts of Palmerston North is the Rangitaane Tangata Whenua Whare Whakairo (Meeting House and Turangawaewae) Tuturu Pumau at Te Hotu Manawa O Rangitaane O Manawatu Marae. Te Hotu Manawa marae is situated in Awapuni, a suburb of Palmerston North. It belongs to the hapū Ngāti Hineaute, Ngāti Rangiaranaki, Ngāti Rangitepaia, Ngāti Mairehau and Ngāti Tauira of the iwi Rangitāne. The whare tipuna is named Tūturu Pūmau. The marae connects ancestrally to the waka Kurahaupō, the awa Manawatū and the maunga Tararua. If you are holding a seminar, workshop or conference, be it for half a day or a full day, overnight or weekend, the Marae is available for birthdays, weddings and special whanau (Family) events. For the ultimate cultural experience, contact us. This facility can comfortably sleep up to 80-100 guests as well as accommodate up to 150 for half day and full day conferences. Tuturu Pumau at Te Hotu Manawa O Rangitaane O Manawatu Marae is located within 5 minutes drive from the Central City, and 15 minutes from the Airport, and is a quiet and peaceful location to hold any event.